Now it’s even easier to enjoy your favourite comfort foods. 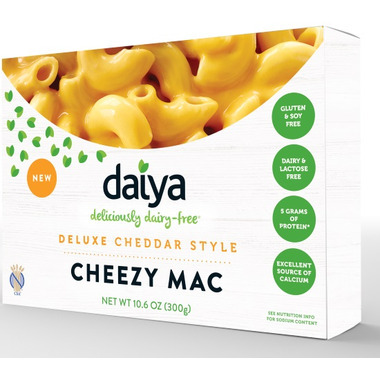 Daiya's delicious Cheezy Mac comes in three incredible flavours your whole family will love. It’s made with a velvety cheeze sauce (in a convenient squeeze pouch, not powder) and hearty whole grains. And just like that, dinner is served. 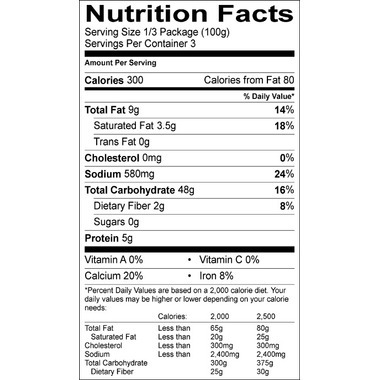 Ingredients: brown rice pasta (whole grain brown rice, rice bran, water), filtered water, tapioca starch, non-GMO expeller pressed: canola and/or safflower oil, coconut oil, sea salt, vegan natural flavours, pea protein isolate, potato protein, tricalcium phosphate, cane sugar, lactic acid (vegan), xanthan gum, yeast extract, titanium dioxide (naturally occurring mineral), annatto (colour), onion. One of my favorite things is mac and cheese. I had to give it after having to go dairy free. This is a great alternative. My son and I love it! This is the only mac and cheese that my son will eat. Delicious! I eat dairy and my daughter does not, even I love this! Mine and my fiance's fave mac and cheese and we are not even vegan! Dairy does bother our tummies though, so that was the initial purchasing decision. So satisfying and delicious though - have re-purchased so many times and consider this to be a necessary staple pantry item. Thereâ€™s something about this that I love so much. Itâ€™s perfectly creamy and delicious. Best substitute for the real deal. I leave a bit of the pasta water in with the noodles before adding the cheese sauce to combine easier. So damn good you will hardly believe it is vegan and gluten free! I loooove this mac& cheese! Its perfect :) Who needs cows cheese when you can have this! I was really excited to try this product after recently going dairy-free, but unfortunately I was rather disappointed. I find the cheese tastes like plastic, itâ€™s not to my personal taste. Yum...we love this..best winter comfort food..cheesy and warm.. Enjoyed this product and will buy again. I didn't love this mac n' cheese substitute. It's a bit chalky and not very cheesy, I think maybe adding broccoli or a little organic ketchup might help. My favorite dairy, gluten and soy free mac & cheese so far. Really tasty. Thanks Daiya! Probably one of the best vegan products on the market! This is surprisely really good! It tastes like velveeta mac and cheese. Daiya keeps improving their products, their new dairy-free cheese slices are also getting better. I highly recommend it for a healthier version of mac and cheese. Plus, it doesn't hurt our animal friends because it is 100% plant-based. I'm lactose-intolerant and it's tough to find things the whole family can eat together. This stuff is dangerous, as in dangerously good! Even the kids like it! This is amazing and vegan even my super picky carnist family love it. Best and most delicious alternative to traditional boxed mac and cheese I have found yet. A bit on the salty side, but I really like the creamy sauce that comes in the package - not the powdery stuff so many of us are used to from our childhood (and not so childhood) faves. It is especially good when combined in a casserole (I made a tuna casserole with this, and it was comfort food personified). Bottom line, I would buy this again and again, especially because it's non-GMO. Quite yummy for a dairy-free mac and cheese. I was pleasantly surprised by the creamy texture. I'll definitely be buying this product for when I want a hit of comfort food. I love that it's gluten free! Taste-wise it's not really that cheesy, but I haven't come across any fake mac and cheese that does. My husband wont eat it, but my toddler loves that he can have "oni and cheese"
I love this Cheezy Mac from Daiya. Being gluten free and vegan sometimes I have to forget old flavors and settle for something different BUT this is one of the best mac and cheese I have ever had!